If you’re looking for the best Black Friday 2018 PS4 deals in the UK, then you’ll find the cheapest PlayStation 4 games, lowest priced PSVR headsets, and hottest PS4 Pro bundles here. We’ll be updating this guide right throughout Black Friday 2018, so be sure to bookmark it and check back regularly for new lightning deals and discounts right throughout the coming weeks and days. While you’re here, be sure to also check out our guide to the Best Black Friday PS4 Deals in the USA through the link. Don't forget to also refer to the Best Black Friday 2018 PS4 Bundles, Best Black Friday 2018 PS4 Games Deals, the Best Black Friday 2018 PSVR Deals, Best Black Friday 2018 PS4 Controller Deals, Best Black Friday 2018 PS Classic Deals, and the Best Black Friday 2018 PS Plus Deals through the links. What are the best PS4 Black Friday 2018 deals in the UK? We've scoured the web for cheap PlayStation 4 games, discounted PS4 Pro and PS4 Slim consoles, reduced PSVR headsets, and cut-price PlayStation accessories. We'll be refreshing this list over time, so bookmark this page as we add more lightning deals and hot discounts. When Is Black Friday 2018 in the UK? While we don’t celebrate Thanksgiving in the UK, Black Friday traditionally takes place the day after the American holiday, which in this instance happens to be Friday, 23rd November. However, you should expect deals to go live up to one week ahead of the event itself, so keep an eye on this page as we add new bargains over time. 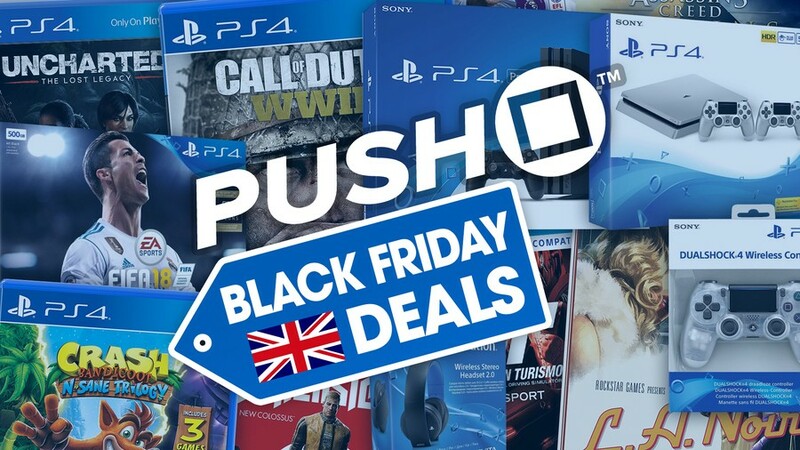 What PS4 Deals Will There Be on Black Friday 2018 in the UK? Sony’s not announced an official selection of savings for fans to expect during Black Friday 2018 in the UK, but you should probably anticipate the usual roster of savings, spanning cheap PS4 consoles, to PlayStation 4 games deals, and reduced PSVR bundles. For more details on the latest savings, you can check out the Best Black Friday 2018 PS4 Bundles, Best Black Friday 2018 PS4 Games Deals, the Best Black Friday 2018 PSVR Deals, Best Black Friday 2018 Controller Deals, Best Black Friday 2018 PS Classic Deals, and the Best Black Friday 2018 PS Plus Deals through the links. Why do your UK Amazon links always take me to broken US pages? @fuzzy833 It tries to detect your region. I assume you're in the States? It seems like Detroit is the big deal this year. There is always one bargin Yakuza 6 seems like a cracking price too. I was hoping for a little more off Dragon Quest at Game (34.99). I have a gift card that would knock half off that so wish the argos price applied there too. Might wait on that one. No deals about for Valkyria Chronicles 4 it seems. I dunno if the PS classic is a Black Friday deal! Shenmue 1 and 2 for £15 is kind of interesting, those games really seem to have come and gone. Anyone here actually play them both through? @kyleforrester87 I played through them both, but they're like my favourite games ever. I don't think they've aged terribly, but still an acquired taste. I’ve played the first one. Can’t recommend enough. I never had a Dreamcast and played the game years later so I’m not filtering through rose coloured glasses either. Ni no kuni 2 on for 18 quid at Argos, still got loads of games to play but tempted at that price! Black ops 4 is £30 in Tesco. Picked that up and also saw Spiderman for £29 and I'm pretty sure God of War was £20. Plenty of stock in store. Set up my PSVR last night, just mucked about in the VR playroom. Just incredible can't wait to play some proper games! Cant see GoW on Amazon at £20.99. It was earlier in the week but it seems to have disappeared. still think the console deals are a tad overpriced, base model should be coming in under £200 and pro under £300, imo. @Nifty I got GoW in Curry's yesterday for £19.99. You could try there?